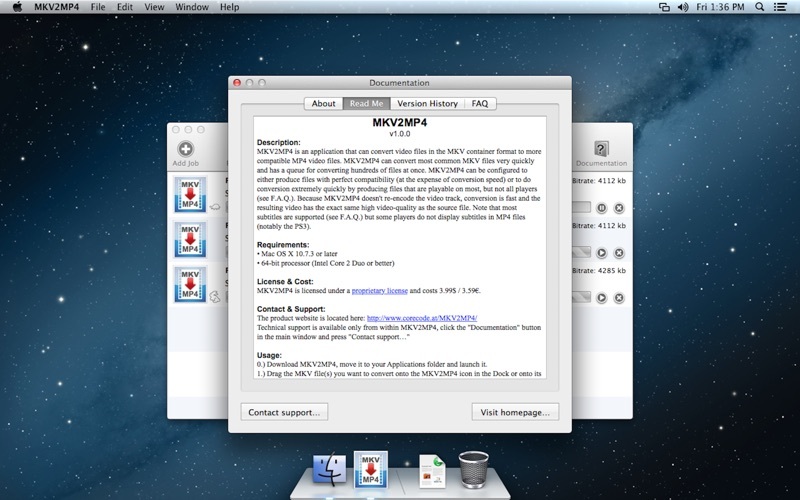 MKV2MP4 is an application that can convert video files in the MKV container format to more compatible MP4 video files. MKV2MP4 can convert files so fast because it doesn’t re-encode the video data but just copies it into the more compatible MP4 container format. 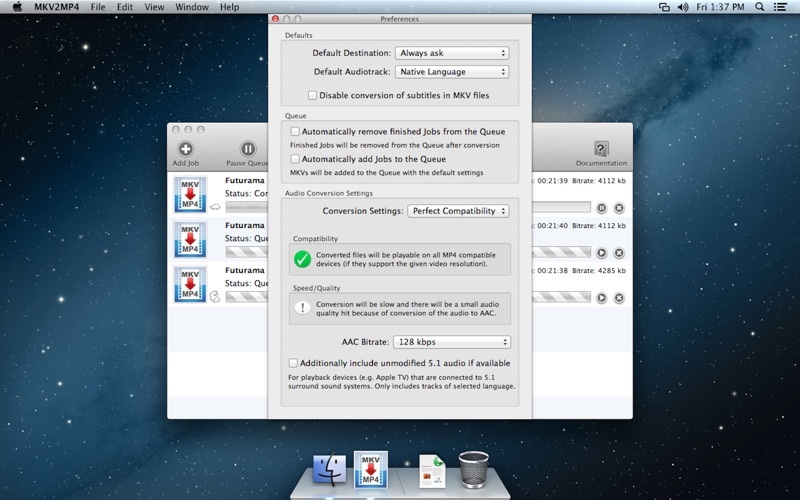 You can choose in the preferences whether you want highest speed for the audio conversion or the highest compatibility. Because MKV2MP4 just copies the video data into the new container format there is absolutely no loss of quality, the converted files are pixel-perfect copies. Full-HD videos are fully supported. MKV2MP4 can convert hundreds of files at once with it easy-to-use queue system and features convenience options for automatically adding many files without any further work. MKV2MP4 features 3 modes of conversion. You can choose perfect compatibility for files that will play on every MP4 compatible player. Or you can choose highest speed and the files will still play on most player (notably except iOS devices). Additionally there is a custom mode where you can arbitrarily define how to handle audio conversion. There are also options for automatically adding files to the queue and removing them afterwards for batch handling. Most subtitles are fully supported as well (see F.A.Q.). If your file contains a surround sound track you can use MKV2MP4 to generate files that play with perfect 5.1 surround sound on your supporting target device. MKV2MP4 even supports generation of files that play with surround on the AppleTV, which has special requirements. – MKV2MP4 does not do video downscaling, it is not suited for converting HD videos for playback on (old) devices that don’t support HD resolutions (like the iPhone 3G(S)). – Some files (that contain too many ref-frames, 10-bit video or are larger than FullHD) will not play on some devices like the PS3 that don’t support these features. – MKV2MP4 does not preserve all audio tracks. 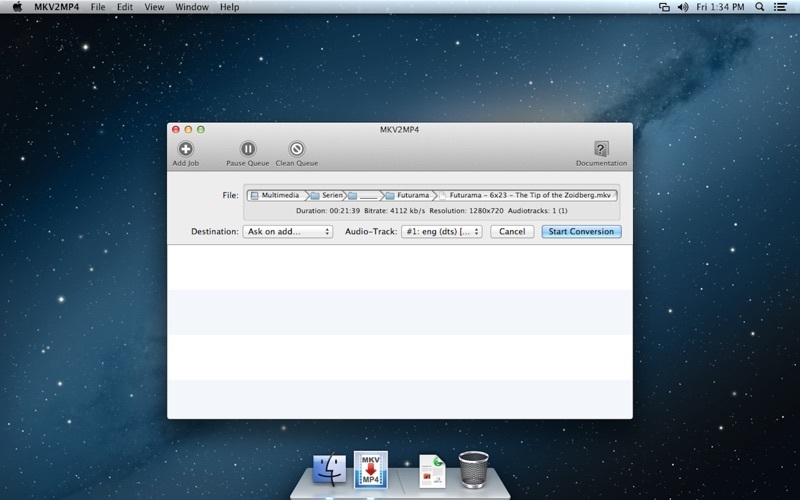 You can select one audio track to convert and optionally include a surround version of the same language (if available).